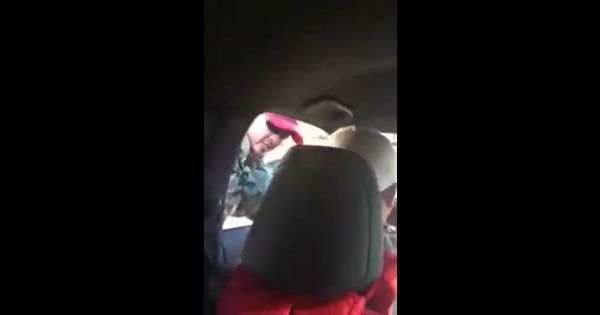 A "viral video" that captured an altercation between a "rude traffic enforcer" and taxi driver has fooled thousands of viewers on Facebook. The alleged traffic enforcer was caught on cam cursing and hitting a cab driver after the latter was "apprehended" for an unknown traffic violation. Speaking in mixed Tagalog and Ilocano, the alleged kotong enforcer tried to get the car key, asked for the driver's license, and warned to review the CCTV footage to prove that there was a violation, but the taxi driver firmly said he did not break traffic rules. When the alleged traffic enforcer was told by passengers sitting at the back of the taxi that they were taking a video, he quickly shifted his mood from hostile to calm and clarified that his intention is just to talk to the driver and not apprehend him. He then flashed a pa-cute hand gesture and asked the passengers if he looks handsome in the video. In a matter of seconds, harsh words and comments against the "rude traffic enforcer" flooded the Facebook page where the video was reposted. Some of its followers slammed the "violent act" and advised the driver to report the "incident" to the 8888 public complaints hotline. One commenter even wished for the alleged traffic enforcer to suffer summary execution. It turned out that the altercation was scripted and the scene was staged. In short, everything was a hoax. It was a brainchild of Facebook comedian Joel Villanueva Mondina of the Father/Son DUO fame, who portrayed the fake traffic enforcer in the video.